The trend in tech this year seems to indicate that very few people do -- as long as they can take their gadget with them wherever they go to surf the Web, catch up on email or comment on a friend's photo. For the first time, there is now a greater demand for tablets than there is for laptops. Tablets like Apple's (AAPL) iPad, Samsung's Galaxy Tab, and Amazon's (AMZN) Kindle Fire are cheaper than laptops and allow consumers to do more on the move. Experts from IDC, a technology research group, expect about 41.9 million more tablets to be shipped this year than laptops. 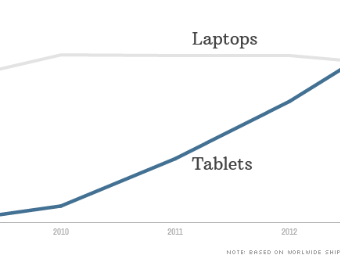 In fact, the number of tablets shipped are expected to surpass all PCs -- laptops and desktops -- by 2015. That's not surprising, considering shipments of PCs had a record-setting bad quarter earlier this year.